we just acquired a Sunray 2.5k HMI par, came w/ballast which has bates plug at end of it. because everything all worn off, you can't tell what amperage and specs needed. we're wanting to run this from our Honda eu7000is gene, which gives us a 30amp 220v 4-prong. safe for initial spark/and load.? a single box on other side w/female bates. thoughts? I don't know about your weird American plugs, and you don't say what voltage the luminaire is, but 30A at 220V is over 6kW, so that's enough current. The amperage will depend on the voltage input of the ballast. I'm assuming you are here in the USA and that ballast will most likely be using 120v and a 60amp bates connector. You can make an adapter. On the 4 prong twist lock you'll only use 3 of the pins though. NOTE: Please know that using the Honda 7000, the specs for continuous use are lower. 5500watts. Continuous use is 30mins or more for the Honda generators. Because of the constant improvement in HMI ballast technology you could have one of three types of HMI ballasts. How you power it on your Honda EU7000 depends on what type of ballast you have. For a Sunray 2.5 you have a magnetic or electronic ballast; and to complicate matters even more, you have a either a Power Factor Corrected electronic ballast and non-Power Factor Corrected electronic ballast. The early line of Lightmaker electronic ballasts were nick named by film electricians “Troublemaker” ballasts because they were not Power Factor Corrected and proved that PFC circuitry was absolutely necessary in large ballasts to reduce heat and returns on the neutral, and to increase ballast reliability. It is probably the case that you have a non-PFC 2.5/4kw ballast since most electronic ballasts of that size were non-power factor corrected. Part of the reason for the number of non-PFC ballasts in this country was that PFC circuitry does not offer a huge advantage when operating 2.5 HMIs on generators or tie-ins. A typical 2500W Power Factor Corrected electronic HMI ballast will draw 23 Amps at 120 Volts verses the 35 Amp draw of a non-PFC electronic ballast. Since, neither ballast will operate on a standard 20A wall outlet, PFC did not offer a huge advantage when operating 2.5 HMIs on generators or tie-ins. However, the added efficiency of a PFC 2500 ballast can make a huge difference when powering a lighting package off of a portable generator. For example, when you consider what LED fixtures draw, the 12 Amp difference between using a PFC 2500W electronic ballast and standard non-PFC 2500W electronic ballast, can mean the difference between running six additional LED fixtures on a portable generator or not – I think you would have to agree that is a major boost in production capability and pertinent to any one using a portable generator as their principle source of set power. You have several options when it comes to operating your 2.5kw HMI off of a Honda EU7000 generator depending on the type of ballast. Where electronic HMI ballasts are typically auto-sensing multi-volt ballasts (with an operating range of 90–125 & 180-250 Volts), you can plug it directly into the 240V 4 pin twist-lock receptacle on the generator and it will operate at 240 Volts. Where your 2.5 kw ballast is wired with a 120V 60Amp Bates Plug (Stage Pin) you will need a 120V 60A Female Bates to 240V 4pin twist-lock adapter to plug your 2.5kw ballast directly into the generator. To make the adapter wire ground to ground, the two hots of the male 4-pin twist-lock (X & Y) to the hot and neutral of the bates female, and drop the neutral of the male 4-pin twist-lock since it is not needed. If the electronic ballast is power factor corrected (draws 23 Amps) you can plug it into the 30A/120V twist-lock receptacle on the generator’s power panel. If the electronic ballast is not power factor corrected (draws 35 Amps) you will not be able to run it off of the 30A/120V twist-lock receptacle without tripping it’s fuse. The third possibility is that you have a magnetic ballast. Even though a 2.5kw magnetic ballast draws approximately 26 amps at 120V you will not be able to run it reliably on the 30A/120V twist-lock receptacle on the generator’s power panel. That is because even though the twist-lock receptacle is rated for 30 Amps, as Ed Conley points out, the Honda EU7000 generators are only capable of sustaining a peak load of 27.5 Amps per leg for a short period of time. Their continuous load capacity (more than 30 minutes) is 23 Amps per leg. And if there is any line loss from a long cable run the draw of a 2.5 magnetic ballast will climb to upward of 30 Amps. To make matters worse magnetic ballasts have a high front end striking load. That is, a magnetic ballast draws more current during the striking phase and then they “settle down” and require less power to maintain the HMI Arc. By contrast, an electronic ballast “ramps up”. That is, its’ current draw gradually builds until it “tops off.” For this reason, you must always leave “head room” on the generator for the high front-end striking load of magnetic ballasts. And to complicate matters even more, the lagging power factor caused by the inductive reactance of the magnetic ballast kicking harmonic currents back into the power stream causes spikes in the supply voltage that can cause erratic tripping of the breakers on the generator or ballast. In my experience the load of a 2.5kw magnetic ballast is too near the operating threshold of a EU7000 for it to operate reliably on the 30A/120V circuit. The only sure way to power a 120V 2.5kw (or even a 4kw) HMI magnetic ballast or non-PFC 120V electronic ballast on a portable gas generator is from its 240V circuit through a 240v-to-120v step-down transformer. A transformer will step down the 240V output of the generator to a single 120V circuit that is capable of accommodating the high front end striking load, and even the voltage spikes, of a 2.5kw magnetic ballast and the greater draw of a non-PFC electronic ballast. 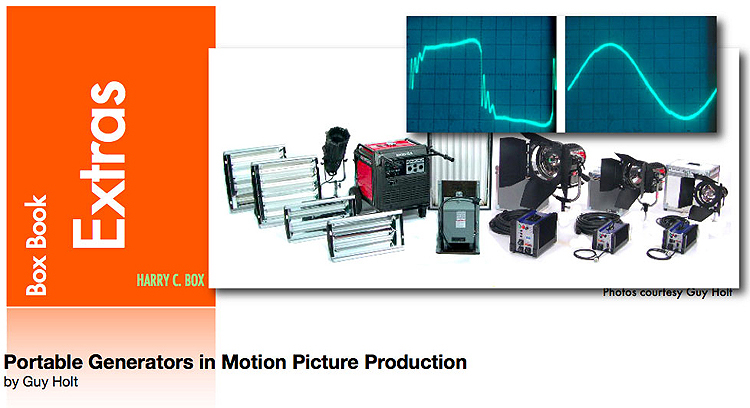 If you haven't already, I would suggest you read the article I wrote for our company newsletter on the use of portable generators in motion picture lighting. In it I cover some of the basic electrical engineering principles behind poor Power Factor, the harmonic distortion it can generate, and how it can adversely affect generators. These power generation issues have been vexing set electricians for years. Use this link for an informative newsletter article that explains the electrical engineering principles behind these issues and how to resolve them. “Following the prescriptions contained in this article enables the operation of bigger lights, or more smaller lights, on portable generators than has ever been possible before." The article is available for free online at http://www.screenlightandgrip.com/html/emailnewsletter_generators.html.